Remember this post last week? Where I was making fun of myself for thinking I had taken all the Christmas decorations down and then I noticed that red-and-green paper chain hanging in clear view on my kitchen wall? Well, for starters, it is still there. Apparently, I am too busy blogging about it to take it down. 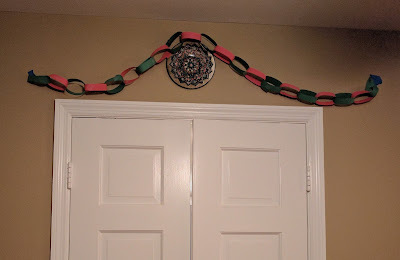 And then, the other night, while I was taking pictures of Rachel modeling my Nurmilintu shawl, I noticed that there was a chain hanging above the dining room doors. Hey, that's understandable, I thought. It's way high up and out of the way. Who would even look up there, amirite? So tonight I was taking that picture of it there to share with all of you, when Susie said, "What are you doing?" 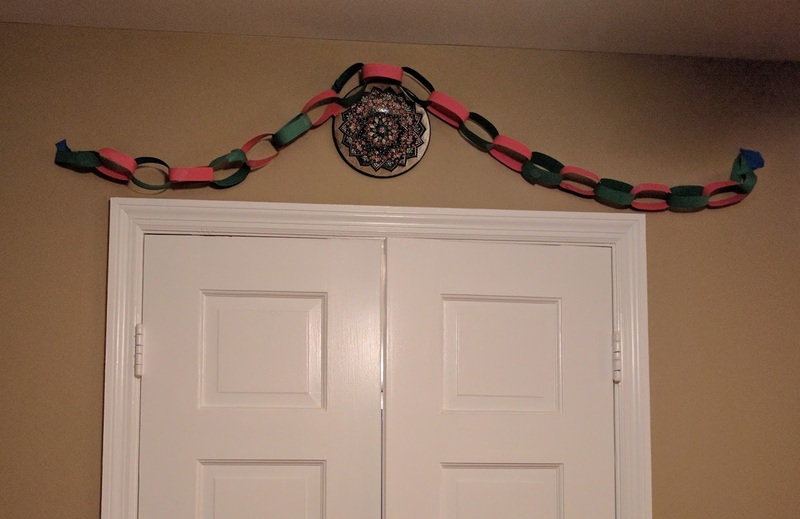 "I'm taking a picture of that paper chain. I thought they were all gone, but I missed one." "But there's more," Susie said. Danged if she wasn't right - there was a HUGE chain stretching across the entrance of the den. I must walk under that thing 50 times a day on my way to the computer. "Shoot," I said, aiming my camera (see what I did there?) at the offending decoration, "I thought they were all gone!" By this time, I kid you not, Susie was rolling on the floor and screeching with laughter. 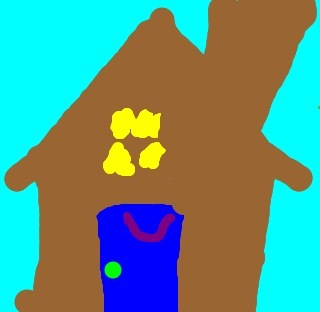 "Look at the windows, Mommy! The windows!" Double dang. 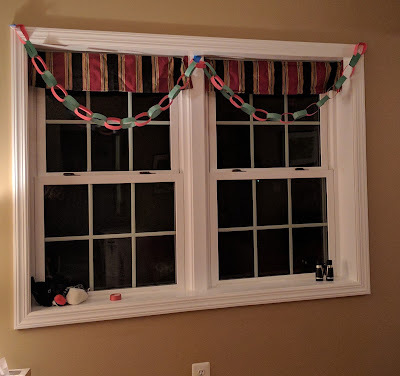 These living room windows are in my direct line of sight every single time I walk in the front door. My only defense is that all of these are hung out of my reach, so it's hard for me to take them down. Although that wouldn't explain why I don't even SEE them, right? Yikes. I think this is the post where I am supposed to announce the winner of the Yarn Harlot book, but I haven't gotten around to figuring that out yet (not least because some people who want the book are commenting on the wrong post, so I have to go find those comments and include them and WHY are you people making my life so difficult, anyway?). So, yeah, you have another day to comment (ON THE CORRECT POST) and let me know you want the book. Who knew giveaways could be so hard? 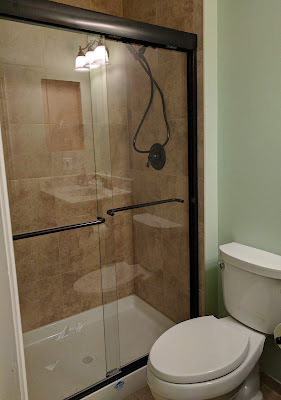 In other news, let me introduce you to our new shower doors! It's been an entire 24 hours and they still stay on track, don't get stuck, and have not once tried to hit me over the head. I call that a home improvement win, don't you? 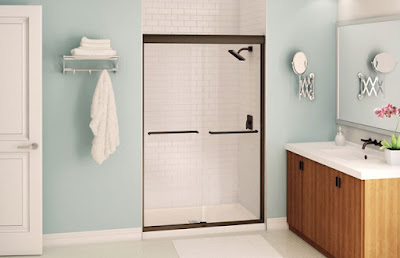 I took my first shower in there today, and it would have been a marvelous experience if we weren't having this weird problem lately with our tankless water heater - i.e., we never know if our shower will be hot, warm, or barely tepid. It's like Russian Roulette, only not as fatal. Yes, I HAVE called the repairman, who couldn't find any error codes on our electronic wonder and left with a vague promise of calling the manufacturer to find out if there have been similar complaints. In the meantime, mornings (which were already a little unpleasant, although not hiding-out-from-the-Nazis unpleasant, I'll admit that) have become downright unsatisfactory. Turns out I really need that hot water shower to start my day off right - who knew? See the toilet in that picture? It's new. 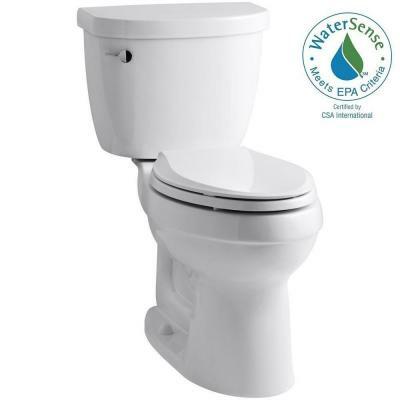 It flushes in one fell swoop and then refills in under 30 seconds. It would be perfect except that it has a self-closing lid. You can't close it on your own, or it will break. Instead you have to lightly start it on its descent and it does the rest. One, I resent the implication that one needs automation to close a toilet seat lid all the way down to the bowl. Two, how long will it be before someone mistakenly tries to push it down and breaks it? Three, YOU CANNOT SIT ON IT. There are actually innumerable instances when you use the closed toilet as a seat: when you are spending half an hour straightening your tween's hair and she wants to sit down; when you are watching your kids in the tub and want to sit down somewhere that is not wet; when you are applying lotion to your feet and don't want to stand on one leg and then the other to do that, because you don't want to end up in the ER explaining how you got that gash across your forehead from falling face first onto the edge of the vanity. Okay, maybe that last one is just me. Still, who would want a toilet that you can't occasionally sit down on its lid? Who would be stupid enough to buy one? Me, apparently. I now own three of them. 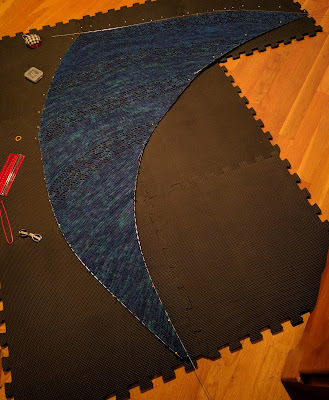 Let's end this post on a positive note: I am finally blocking the Nurmilintu shawl. Please note the thousands of tiny stitches that went into this piece of work. Think about the hours spent pulling the yarn through one loop and then another, over and over and over. And then wonder at my complaining that blocking this shawl was the single most tedious thing I have ever done. But it was - I thought I would jump out of my skin by the time I finally threaded through all those wires and pushed that last pin into the foam pads. Experienced knitters will note that I got the shape wrong. I know. That bottom part should be more to the left. I am still trying to decide if I have the fortitude to redo it. Oh, who am I kidding? I'll have to. Just looking at that picture is upsetting me. Knitting - where OCD calls home. 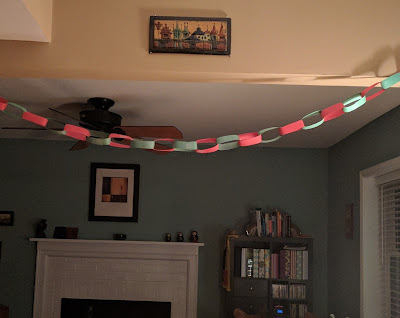 See that red-and-green paper chain hanging in full view on my kitchen wall? Well, I certainly didn't, not until today. Apparently, when I say that I have taken all the Christmas stuff down, someone should check my work. 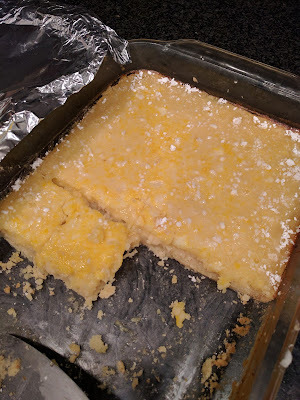 Susie, unfortunately, has taught herself how to make lemon bars. She baked 2 batches over the past 3 days. Double batches, really. This new hobby of hers is wreaking havoc with my already nonexistent waistline. 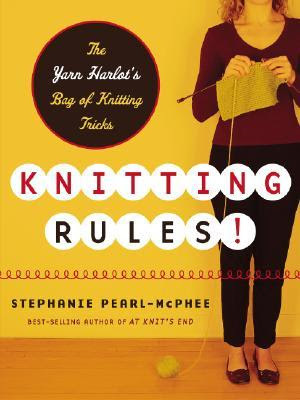 And, lest you forget, make sure to comment on this post from earlier in the week if you are interested in winning a copy of the book Knitting Rules by Stephanie Pearl-McPhee. It's much more than your standard learn-to-knit book, filled as it is with ruminations on the knitting lifestyle and the nature of creativity. It also has a sock recipe. 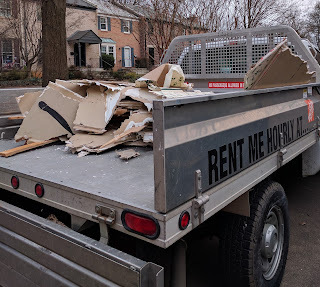 Another day, another crazy morning of having to get out of bed, line up for our showers, and dash around like mad neatening up the bedroom and covering everything with tarps before the contractor gets here to work on the master bath. At 7:30. Did they even HAVE a bathroom? Yeah, it's fun. It brings to mind Anne Frank, actually, because I'm Jewish and was therefore expected to read Anne Frank's Diary at an impressionable age, including the part about how she and all the people who were hiding in that attic behind the bookcase had to get up super early and rush around and get dressed and neaten up before anyone came to work downstairs; after that, they had to be super quiet and not move all day until the workers left. I read that when I was 10 or so, and I remember being glad that I didn't live in hiding, because I didn't like getting up and dressed that early. Growing up Jewish can be special sometimes. 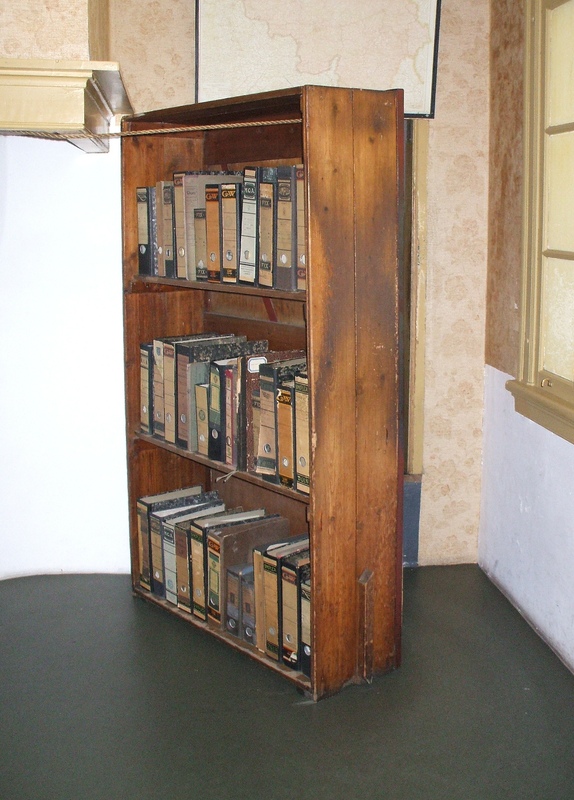 Especially because everything reminds you of Anne Frank, in one way or another. I mean, I just compared having my bathroom redone to hiding from the Nazis. If you're not offended, you certainly should be. In other news, I drove one of my elderly clients to the dentist today, and then sat and knitted in the waiting room while she had her teeth cleaned. (I know, it's a tough job, but somebody has to do it.) There was another elderly woman there (92, as it turns out), with a British accent, and we got to talking, first about knitting. "I used to knit at boarding school," she said. "We would knit socks in the evening for the seamen." "We would put notes in with the socks, and I remember being disappointed when none of those gentlemen replied." Picture me, sitting there, trying to imagine this very old woman as a disappointed English schoolgirl. "Of course," she continued, "I couldn't wait to graduate. I joined the WAAFs right away." And here, people, is where I started paying attention. "The WAAFs?" I asked. "The Royal Air Force? In WWII?" Because, yes, I can do math. This woman was born in 1924. "Oh, yes, have you heard of them?" she said. "YOU were one of the women in those bunkers? The ones marking incoming German planes during the Blitz?" 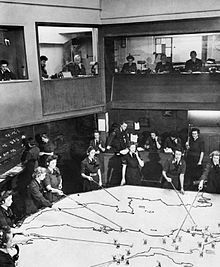 "Oh, certainly - we all stood around that big table with the maps and pushed those planes around," she reminisced. OMG, thought my inner history buff. I'm talking to a WAAF. She's a living piece of history. "Hitler was a terrible man," she added, unbidden. "And this guy in charge now doesn't look much better." Heck, I guess she'd be one to know, wouldn't she? Oh, look, it has a new cover! As I mentioned in this space 2 years ago, this book changed my life. 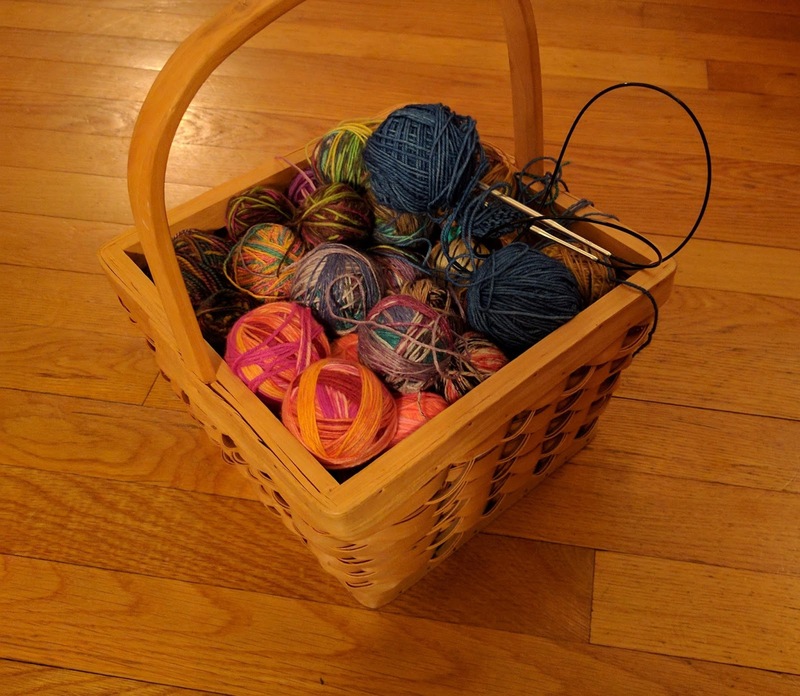 By treating failure as a normal part of the creative process, it freed me to try new things; by virtue of her personal knitting anecdotes, Stephanie gave me permission to knit even though my supplies were not organized and I could never find the right needles. She allowed me to make mistakes and keep going, because really, who cares? This book helped shatter the bonds of perfectionism that kept me from ever getting anything done. I know, it's just a knitting book. How the heck could it do all that? Beats me. And maybe your results will differ. But if you are interested, drop a comment on this post and I will draw a name out of a hat (figuratively speaking, of course) on, oh, I don't know...Friday? Yeah, Friday - that's usually a slow news day around here. And, speaking of news, Larry forwarded this BBC article to me yesterday. According to some scientists, "Browned toast and potatoes are 'potential cancer risks'..." Apparently, browned foods contain large amounts of acrylamide, which is a cancer-causing chemical. To which I say, just kill me now. I mean, our thrift-store toaster alone must have taken years off our lives already. Click that link - it explains an awful lot about our family. And buttered toast just so happens to be one of humankind's universal comfort foods - can the world afford to have that taken away at this point? From where I sit, lately it feels as though the only things holding us all together are pink knitted hats and nice, crunchy toast. Over the past year, as I kept tugging on the worn-out waistband of my spandex pants to keep them up during yoga class, I would think, "But I just bought these. These are my NEW exercise pants." No - no, they weren't. 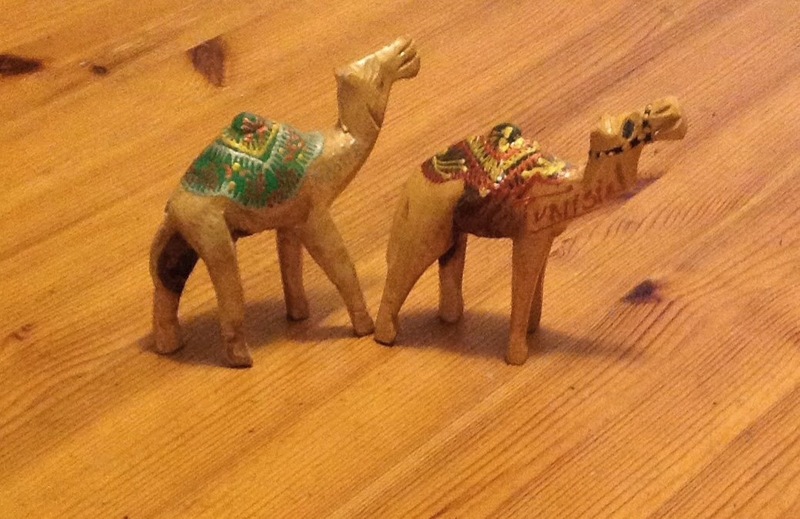 I had bought them in January of 2014, when I hobbled back into the yoga studio. They were cheap. And they were finished. 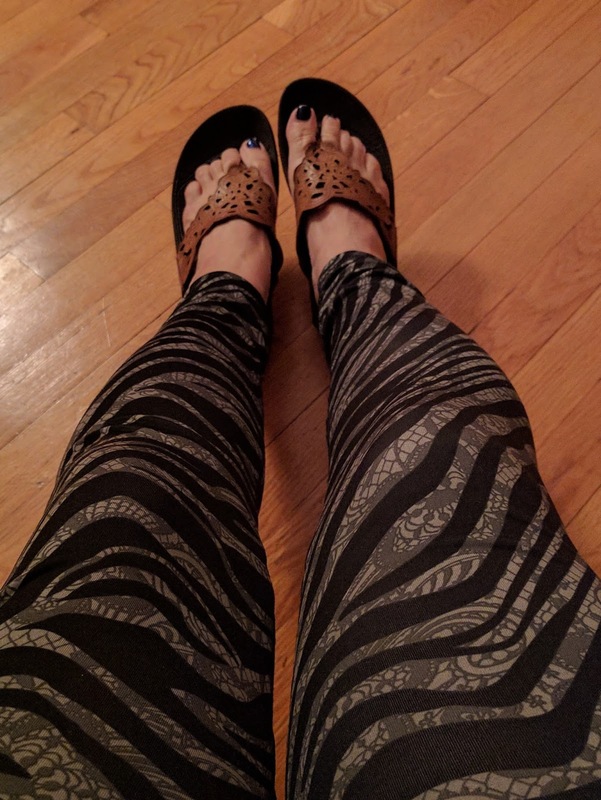 So I noticed an Amazon Deal-A-Day sale for exercise leggings last week. Only $15! But they were all of the patterned variety. Now, I'm a basic-black chick, myself, but for $15? I thought, Heck, everyone else wears patterned leggings - I can do this. Look, I know it's not bungee jumping, but I've got to start somewhere, all right? I wore them to yoga on Saturday, where I swear I felt the Power of the Pants. I mean, it probably helped that I didn't have to keep hitching up the waistband, but beyond that - they put the bark in my dog pose, the fierce in my warrior. 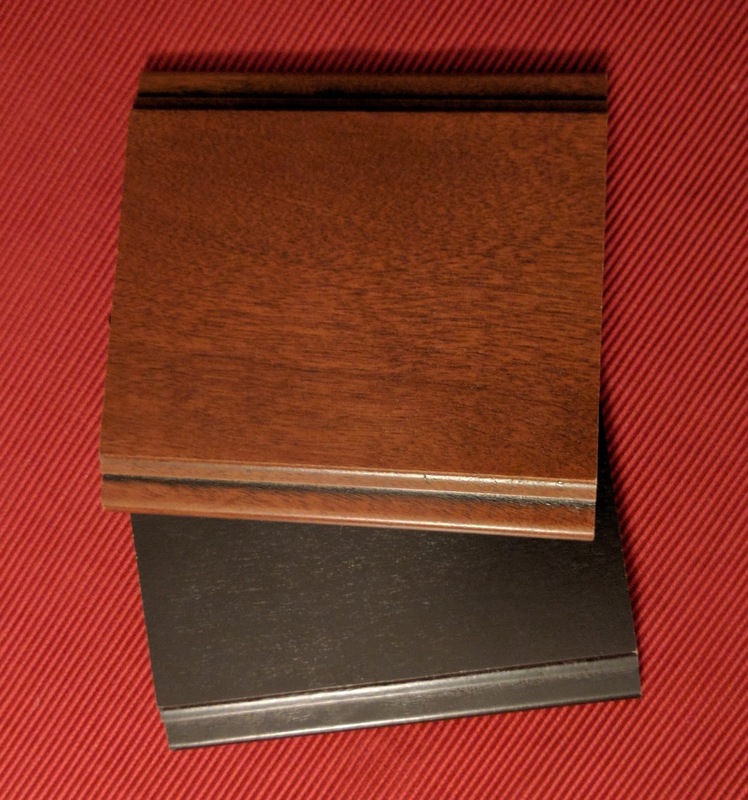 I did keep mixing up left and right (as is my wont), but a fellow student cut me some slack by suggesting that maybe I had put the pants on backward by mistake. I hadn't, but it was nice of him to give me the benefit of the doubt. I went to yoga again on Sunday (because I am a rock star) and then came home to eat lunch and take Rachel to Costco to pick up her new eyeglasses. She was pretty much standing at the door, waiting, anxious to be able to see properly again. "Okay," I said, picking up my purse, "I'm ready, let's go!" "I can wait," she said, "until you change your pants." I looked down at my legs, wrapped in the splendor of black tiger stripe Spandex, and said, "No, I'm good - I've got this big sweatshirt on. It's cool! Everyone wears these!" Larry spent the day completing his destruction of the main basement area, which I think was his way of adjusting, so hey, I didn't get in the way. Brian helped, but I don't think he was too happy about it. All in all, a good, productive day, until we came home from the movie theater and Rachel rolled her eyes at me one too many times. She then tried telling me what was and wasn't her job. I explained that her job was whatever I said it was. Sheesh, Michelle wouldn't take that nonsense from Sasha, I'm sure of it. 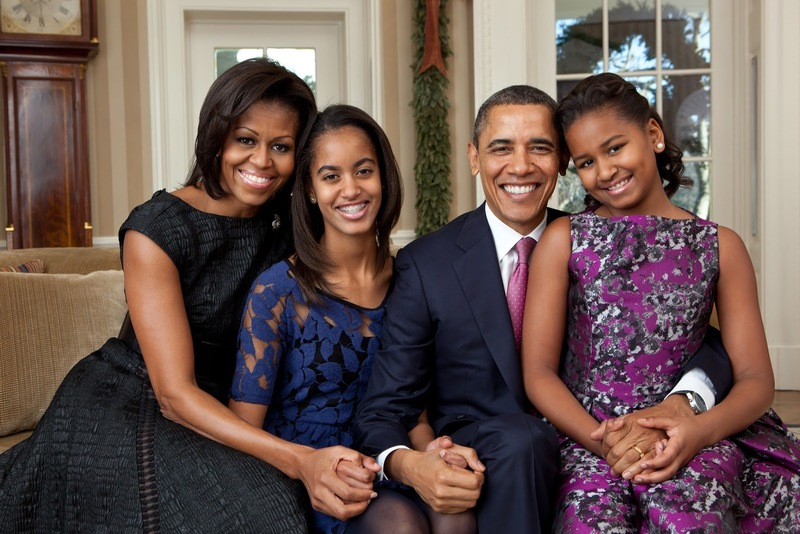 See what happens when the Obamas leave? I paid for that girl's movie ticket, too. I want my money back. John the contractor was here most of the day, working on the master bath that might never be finished. Still, the parts he has done look awesome. 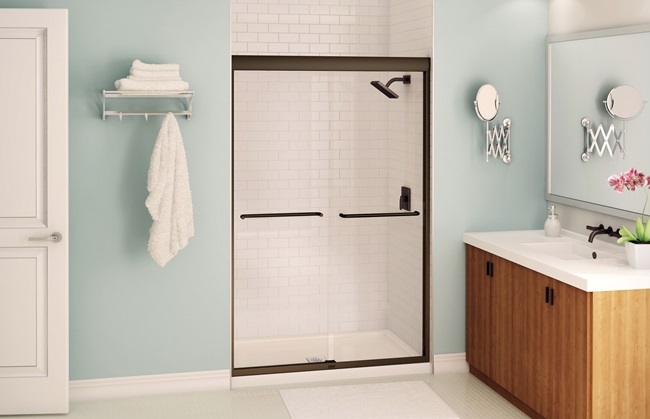 We were talking about the tiled shower the other night at dinner (because we have scintillating conversations like that) and Brian said, "It looks so nice, it doesn't even seem like our house." Don't worry, honey, give us a few months - I'm sure we'll fix that. And then Brian said, "Oh, hey, I'm going to shower in there now; it looks way better than our other bathroom." I'm sure Michelle Obama would approve. ...my key fob wasn't opening the electric sliding doors. And neither were the buttons inside the car. We had to push the doors open slo-o-owly. By hand. I know, first-world problem, but still. "Was this happening yesterday?" I asked Rachel. Larry had used the van Saturday to transport a bunch of Civil Air Patrol cadets to a weekend workshop. "Oh, yeah, we were opening them this way the whole time!" she said. So I spent the ENTIRE DAY worrying about the minivan and Googling repair costs and kicking myself for not handing Larry the old minivan and getting myself a new one while I had the chance (hey, Larry doesn't have to load and unload kids a zillion times a week. He'd probably NEVER use the sliding doors). I was reading quotes as high as $2000 a door, because apparently the cable eventually frays and somehow that wears out the motor, and I don't even know what I am talking about here, but hey, $4000. Still, odd that both doors went at once, right? Right. Somewhere along evening, I read that, if the electric isn't working, it's easier to manually open the doors if you set the master power door button to Off. So I went outside to fix this master power door button that I didn't even know existed - you know, the one down below and to the left of the steering wheel? Where maybe Larry's knee could inadvertently hit it? Yup, it was already off. And that's how I saved $4000 on Sunday. 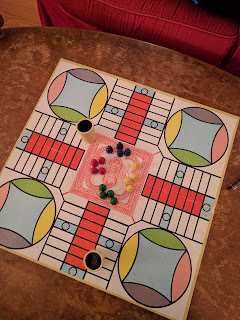 It was a Parcheesi kind of day today, while Larry was busy destroying our basement (more on that below) and the contractor was hammering away upstairs in our dismantled master bathroom. I taught Susie how to play and we whiled away a couple of hours, whilst Larry hauled wheelbarrow loads of torn-up drywall out to the pickup truck he rented from Home Depot and then drove it all to the dump. I think we all can agree that Larry sure knows how to spend a holiday weekend. It was also a play-with-your-yarn sort of day - when I wasn't torturing Susie with old-fashioned board games, I was busy photographing my yarn and adding it to my Ravelry stash. 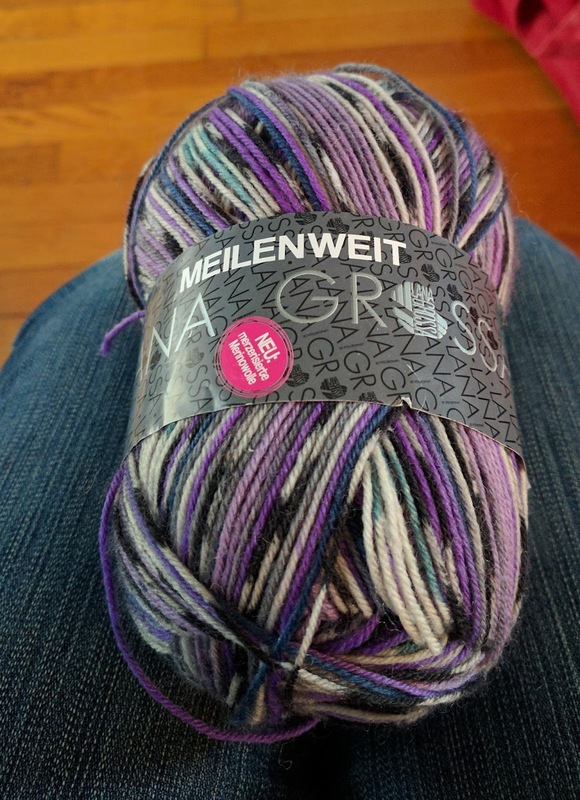 Susie saw me taking pictures of my recent yarn purchases and said, "Why are you doing that? That is really silly." But I think she's just mad I won at Parcheesi. I also organized all my leftover sock yarn and started using it to knit a lap blanket. 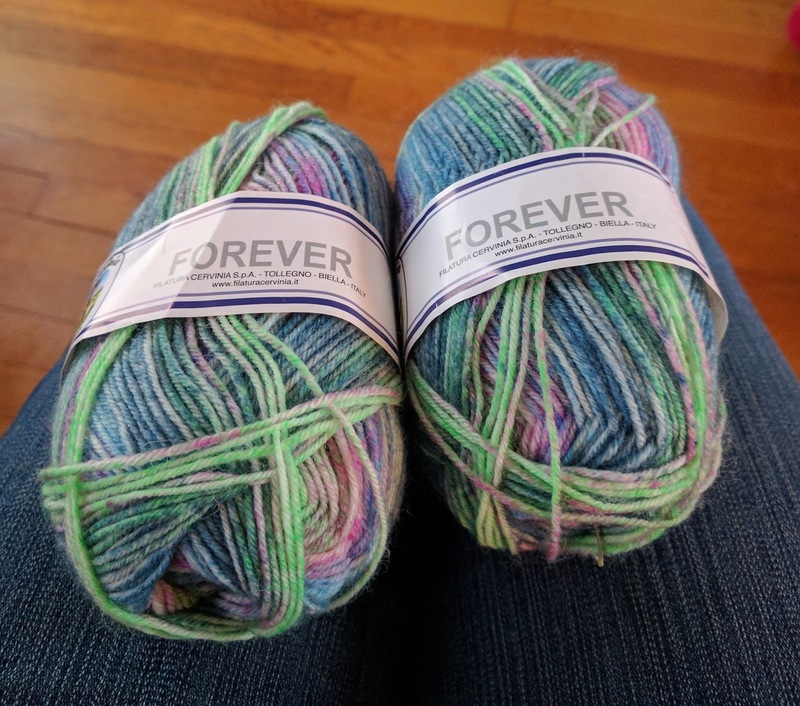 Those of you who do not play with fiber may not realize that knitters consider both of these activities to be a lot of fun. They are also useful if you are trying to ignore the fact that your husband is busy wrecking your house again. 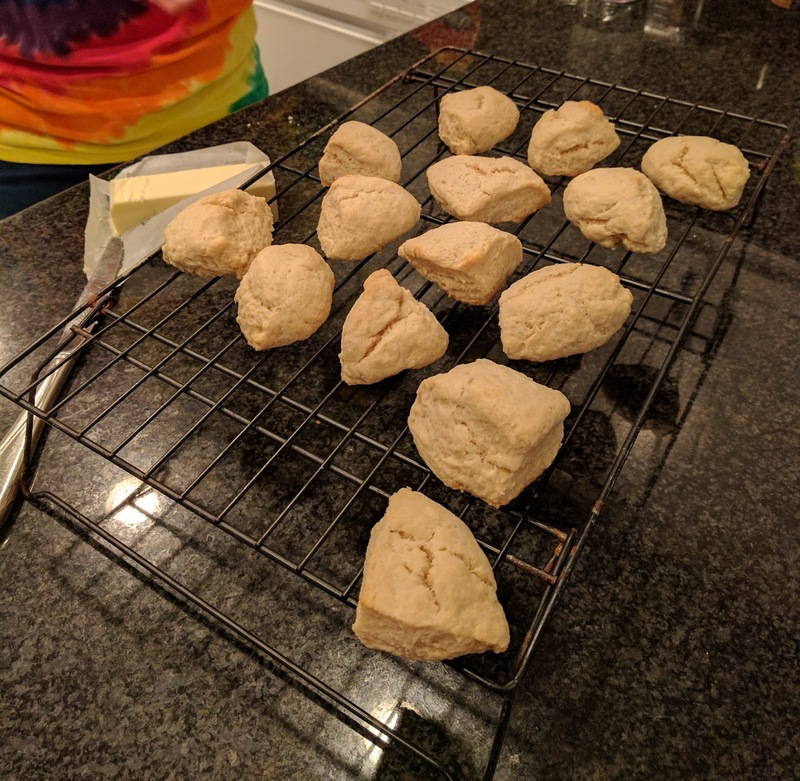 Rachel decided to destroy my resolution to start eating healthy again (mostly because all the New Year's party candy is gone, but still) by baking a batch of vanilla scones and slathering them with butter. She says she just needed a break from homework, but I know better. She has it in for me. 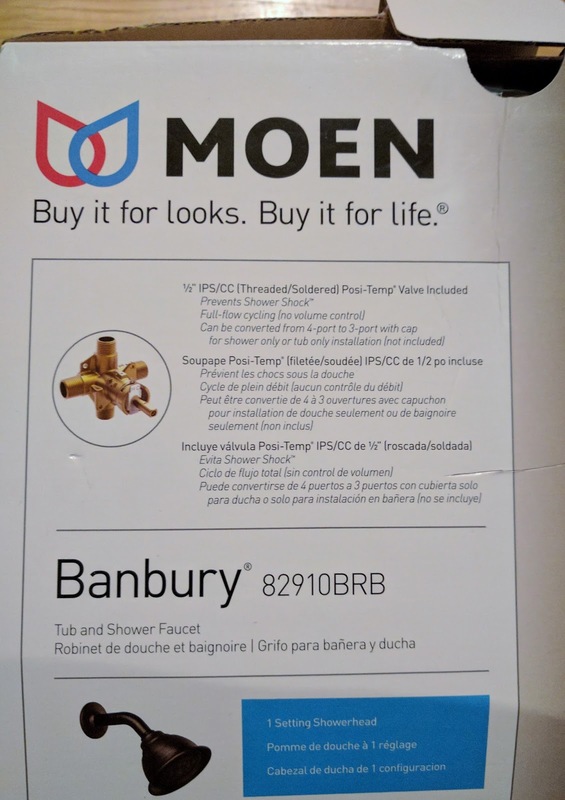 Our renovation crisis du jour: our bathroom contractor opened the box holding the shower head and handle-turny-thingy (I'm trying not to get too technical here) that Larry and I had already wasted an hour of our lives on (selecting and ordering it at Lowes was no mean feat) and discovered something was missing. "Where's the valve?" he asked, for all the world as if he believed I knew something, anything, about plumbing. "This is just a kit," he said. "Where's the valve?" "You mean the handle?" I asked. "The thing that turns off and on?" "No, the valve," he said, waving the apparently deficient shower head around as he tried to explain. "The VALVE. Where is it?" "Um, not here?" I guessed. 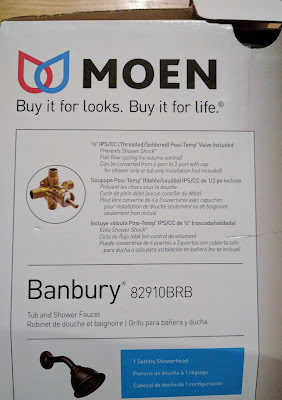 So I ended up running out to Home Depot to buy a whole new showerhead/handle-turny-thingy with valve. I mean, first I tried to find just a valve, all by itself, but the salespeople looked at me as if I had 3 heads. "That's special order," they said. They have an entire section called plumbing, full of things I don't even recognize, and none of them was a valve. Go figure. And, last but not least, Larry commenced the basement demolition today, as part of his ongoing effort to insulate our entire house. 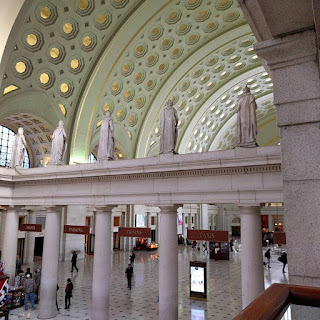 So, I came across this blog post about a week ago - you've probably seen it shared on Facebook, all about traveling across the US via Amtrak for only $213. In reality, it's about double that, if you want to get on and off the train at all; but the idea captured my imagination, big time. I mean, I have never seen the Rockies, I've never seen the prairie, I've never even been to Chicago. Susie is 11, which means that she still enjoys spending time with me (I know, that won't last) AND she is half-price on Amtrak for another few months. Have I mentioned how much I love train stations? So a plan was born: Susie and I (Rachel is also invited, but only if she doesn't glare at us) would get 15-day Amtrak rail passes, good for 8 stops anywhere in the US. We are planning to sleep primarily on the train, to keep things simple and costs low, with maybe a stay at a hostel in San Francisco thrown in there to mix things up. 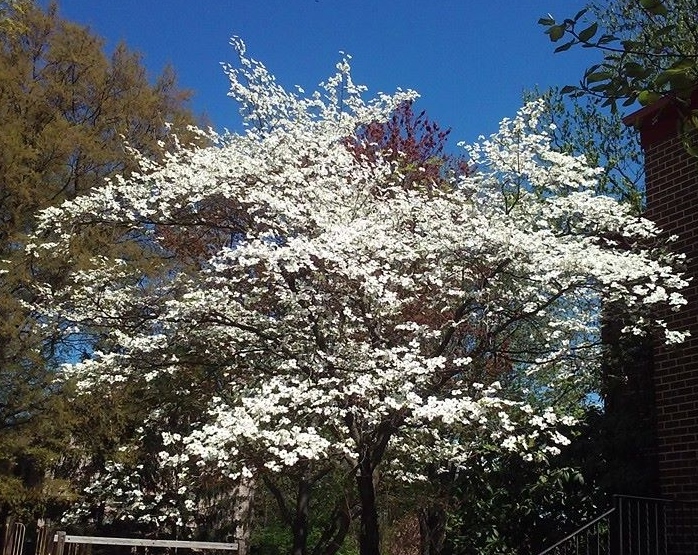 We've spent a lot of time poring over this thing. We are very excited (do you realize how much knitting I could get done on a cross-country train ride?). But here is where you come in: I need suggestions on what touristy things to see if I have, say, 12 hours to spend in a particular city. Fun sights, yarn stores, independent booksellers, iconic local food we have to try, did I mention yarn stores? We're looking at Chicago, Denver, Salt Lake City, for starters. But we are open to other suggestions! 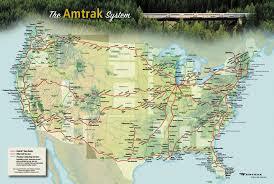 Also, we researched how long train rides between all these cities would take. You know what? This is a REALLY BIG country. Really? NO ONE was impressed by my post title yesterday? I was so darn proud of myself. So, earlier this month, Theo spent a week with us on his way back from the Sinai before heading to Ft. Bragg. As is his wont, he brought his parents and siblings gifts from overseas. We know what that means, right? 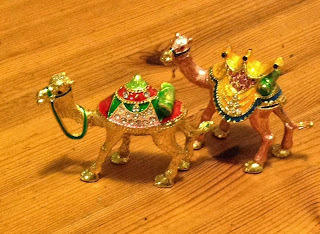 It means that there are a couple of newcomers to what has become a considerable collection of camels. 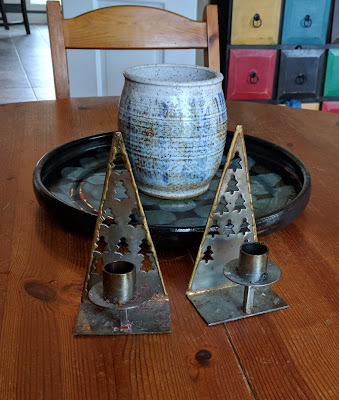 What's annoying is that we haven't used these in years, because I keep forgetting to get candles for them. And even if I did get candles for them, we probably wouldn't use them much, as I am terrified of open flames around children. The whole time they'd be lit, I would be shouting "Watch out!" and waiting for someone's hair to catch fire. So the question is, should I let these things knock around the house the entire year (as the Matryoshka Santa did all last year) or should I just give them away to someone who is less pyrophobic than I am? I can't decide. Currently we have the bathroom contractor AND our handyman showing up at the house bright and early every morning. This means I have to be up, showered, and dressed before 7:30. Now, I know that most of you think that isn't that early, and really, I am usually awake and up by 7:15. But the pressure of HAVING to be up and completely dressed is a bit much for me, hardened SAHM that I am. Yeah, I AM spoiled. What of it? So, anyway, today I overslept until 7:10. I dashed around like a madwoman and managed to be presentable by the time our contractor walked in the door. He looked like hell. "I'm so sick," he said, standing in my hallway and breathing into my air. "I went home yesterday from here, took some Nyquil, and went straight to bed." "Well," I said, drawing my scarf over my face, "feel free to go! No rush on that bathroom - we can wait!" "No, no," he said, "there are a few things I can do today. I'll just work as long as I'm able," and then he headed upstairs to sneeze and cough in my master bedroom for a few hours. He even invited me up there to stand in the tiny gutted bathroom with his virus-ridden self and discuss where to place the medicine cabinet and the lights. In the meantime, our handyman Andy was working downstairs, peeling wallpaper off the few walls Larry isn't planning to tear out. He was there for hours, and I swear it felt like old times, with his tunes blaring away in the basement and Susie running into the den to announce, "That's Andy music!" See these doors? They took away at least 10 hours of my life. And I am ending this post with a picture of the absolutely gorgeous fingerless mitts and Sockhead Slouch Hat that I received at our yarn group's Christmas Yankee Swap tonight. (We were all too busy knitting presents in December to have time for a party then.) 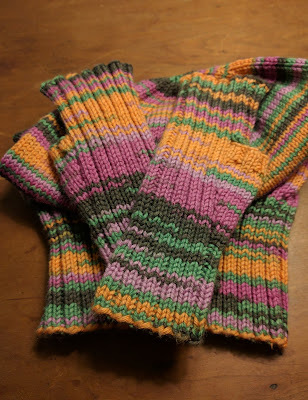 I love these with a passion, because - even though I knit many pairs of fingerless mitts a year and even a few hats - I don't seem to actually own any of either. Also, they look way better than any of the ones I make. True story. That's right - the severed heads of stuffed animals. If only we had thought to market Rachel's creations, all those years ago...it might have paid for all the toilet repairs her mischief-making necessitated. A long time ago, in a universe far, far away, my husband Larry and I were the experienced parents of 6 children, ages 14 on down; and we ran our household with an iron hand. There were bedtimes, and rules at meals, and offspring doing chores without whining. It was, in retrospect, a veritable paradise, wherein dwelled children who listened to their parents and behaved, for the most part, appropriately. And Larry and I looked at what we had created and saw that it was good. You see, we prided ourselves on that, for WE were in control. We KNEW that our children behaved well because we set strict boundaries, disciplined miscreants, and generally enforced law and order. We KNEW that we were forming in our children a lifetime (6 lifetimes, really) of good habits, proper manners, and sensible decision-making. Then our 5th child, Rachel, turned 4. And as a newly minted 4-year-old, she became obsessed with mischief-making. 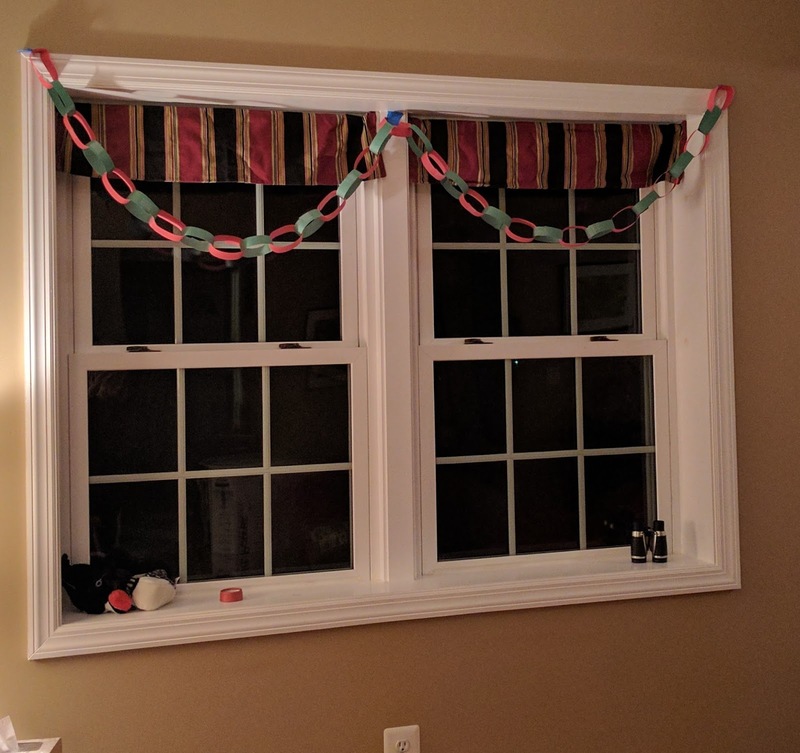 When she wasn’t hiding objects in our toilets and deluging unsuspecting victims with not-at-all-clean toilet water, she whiled away her time by taking scissors to electrical wires around the house; she also enjoyed cutting heart shapes out of random items, including our good clothes and our wool blankets. What’s more, she would tape these hearts on a wall, sometimes with a piece of severed electrical cord affixed beneath them, for all the world like a preschooler gang sign. Naturally, being parents who wouldn’t stand for any such nonsense, we swung into corrective action: we locked the bathrooms, hid all pairs of scissors, disciplined Rachel appropriately, and kept what we thought was an eagle eye on our little loose cannon. But, apparently, we were no match for her Houdini-like abilities. The plumber continued to pay us regular visits, and electrical tape was a frequent item on our shopping list. It was getting to the point, in fact, where Larry dreaded coming home from work, as he didn't want to hear about the latest Rachel exploit when what he really needed was a beer and some peace and quiet. 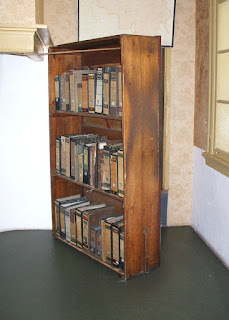 I was living some bad I Love Lucy episode, actually - just picture my husband as Desi Arnaz, brandishing his alarm clock with the cord snipped in two and saying, "Looocy, you have some 'splainin' to do!" And me standing there, wringing my hands, and insisting, "I didn't take my eyes off her for a minute, Ricky!" At one point, Rachel laid off hiding our cellphones in the toilet and damaging electrical cords to pursue what appeared to be her true calling – that of amateur taxidermist. This hobby of hers had started simply, with the beheading of a mere stuffed frog or two, but it soon got out of hand. Every day, somewhere in our house, Larry or I would stumble upon mute witness to her obsession - nothing big, just a headless stuffed bear or other plush animal, with its arms sticking out as if to plead, "Help me!" And the head would be nowhere in sight. Because Rachel had hidden it. 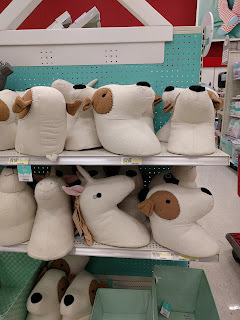 Yes, that’s right – we had a 4-year-old girl who was decapitating stuffed animals and collecting their heads. 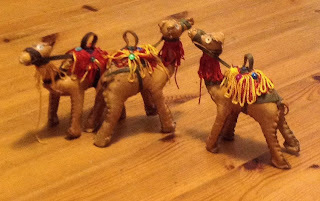 She needed them, you see, so that later – when we weren’t looking - she could mount them on our walls, hunting-trophy style. Now, I had thumbed through many a child development book in my day; and I just didn't recall seeing this sort of thing mentioned in "Your Child at Four" or "The Magic Years." She hadn't, of course, victimized her own favorite, a very attractive stuffed rabbit. So Larry, feeling desperate, told her that he would take Bunny away if he found another headless body. That's right, folks – my husband actually said to his little girl, "Stop the funny stuff, sweetheart, or your rabbit gets it!" The next day? There appeared yet another headless bear, and Bunny? Well, that rabbit was nowhere to be found. Because Rachel had hidden it. Recall, if you will, all those Bugs Bunny episodes where Elmer Fudd jumps up and down with steam coming out of his ears as he says, "Oooh, that wascally wabbit!" 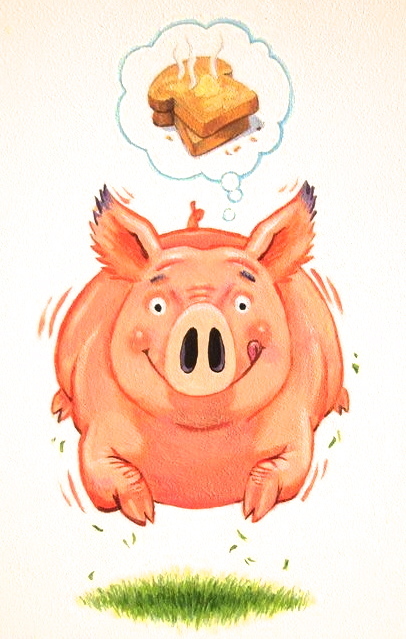 That is exactly what Larry looked like when he realized he'd been outsmarted by a 4-year-old. I must admit, I hadn’t laughed so hard in years. It’s been several years now since our lives were turned upside down by a not-so-innocent 4-year-old. 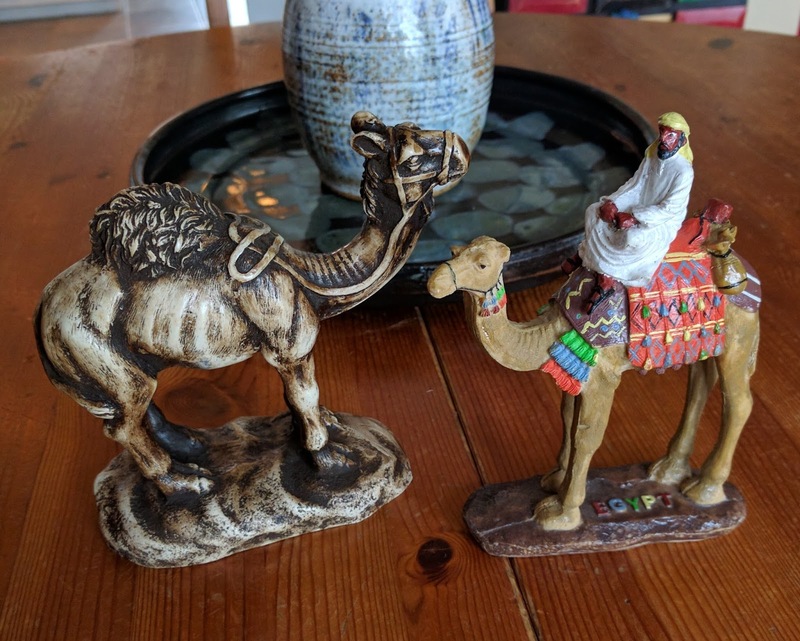 The child in question has grown into a teen with no obvious criminal tendencies, thank goodness, although Larry and I have held onto some of the habits she inspired us to adopt – you know, habits like sleeping with our car keys so they wouldn’t fall into her hands. Rachel herself has little to no memory of any of this. Unfortunately, that means we will never find out just how she managed to remove (and disembowel) that motion detector placed high above her doorway. Some mysteries, I suppose, are just not meant to be solved. And, no, we never figured out where she hid that stuffed rabbit, either. Today, I did something I swore I would never do. I went to Target (no, that's not it, I do that all the time), where I bought 2 storage containers specifically designed to go UNDER THE BED. 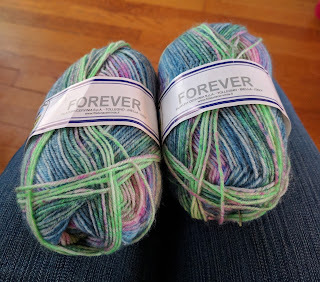 For my yarn. It's always been a point of pride, you see, that - no matter how cluttered the house has gotten - I've never fallen so low as to be storing items under our beds. No, I always left that space clear, so I could easily Swiffer the dust bunnies and could climb into bed without worrying about stubbing a toe against something. My counters may have been covered and my bookshelves overfull, but that space beneath the bed remained pristine and, well, inviting. I never actually hung out under there, but I could have if I WANTED to. This, my friends, is what defeat looks like. So, yes, in a desperate attempt to clean up my room before the bathroom contractors arrive tomorrow (and maybe even free myself from the tyranny of the yarn dresser), I filled up those 2 underbed (wheeled!) containers, one with bulky yarn and the other with worsted, and rolled them beneath my Hemnes bed frame. I'm not proud of that fact, but there it is. 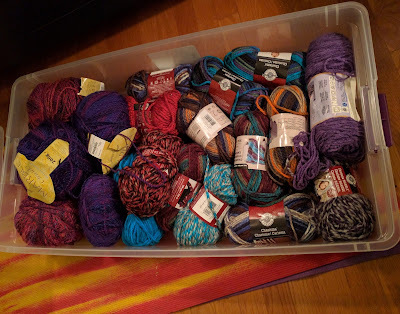 Much to my surprise, my yarn dresser is still almost full (I had forgotten that my roving collection resides in there, too, along with a pleasing amount of sock yarn). So I don't know if I have completely solved my problem. 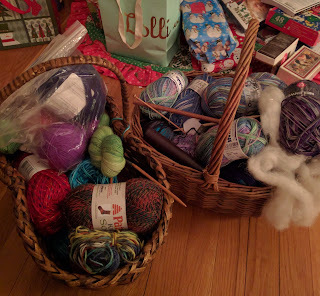 However, my bedroom is no longer littered with baskets of various sizes, all holding yarn; so that's a start, I guess. I'm betting NONE of the above makes any sense to a non-knitter. Don't worry, it shouldn't. 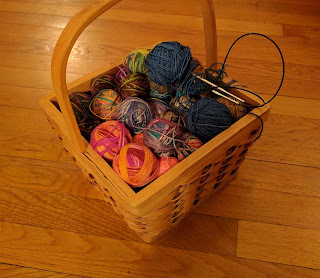 You're all out there living your sane, yarn-free lives, meaning you don't waste valuable hours of your life rummaging through your stuff trying to find the right-size needle or the yarn you've been saving for your latest project. I bet you all even have time to talk to your spouses and interact with your offspring. And that's a good thing. Mamas, don't let your babies grow up to be knitters, I guess is what I'm saying. That's all. Any spare time this weekend was spent in the basement, sorting through books and filling boxes. I think I managed to get rid of 6 or 7 full boxes of books (and seriously, people, I do not know where they all came from - if memory serves me correctly, I did the same thing last year). I managed to persuade Susie to get rid of any duplicate games we own (for heaven's sake, what family needs two sets of Dominos? 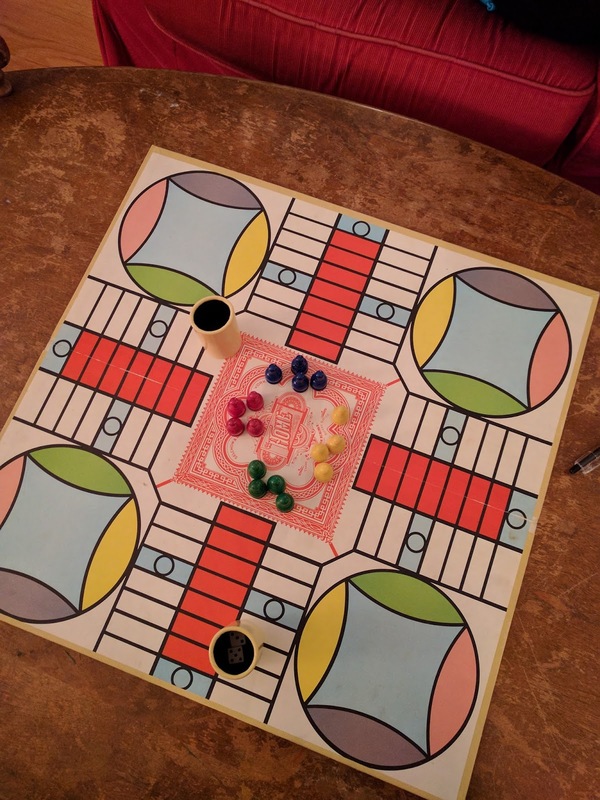 And, uh, THREE Parcheesi boards? ), and we agreed to toss the portable Scrabble, because it is so much easier to play online. Still, there is a lot left, so I've been ruthlessly culling any items left behind by grown children - I figure that if they haven't missed them yet, they never will. When cleaning house, sentiment is NOT your friend. That said, I stayed my hand when I came across a binder full of Brian's drawings from childhood, all in plastic page protectors (yes, I used to be THAT organized - hard to believe, I know). Scrawled pictures of volcanoes (remember? ), Christmas trees, rocket ships - they brought tears to my eyes. So, yeah, I'll have to wait a few years to get rid of that one. There is still so much stuff in this house. I mean, bedding alone is overwhelming me. Larry plans to pile all the boxes in the basement guest room, which means I removed the bed linens, etc., so they wouldn't get messed up or lost. But where does one put an extra down comforter, mattress pad, sheets, pillows, etc.? I eventually managed to shove most of the linens in the guest room dresser, but they are sharing close quarters with the equipment for Larry's ill-fated kite-flying hobby. Oh, my goodness, that link really is a blast from the past. Also, I hate to admit it, but I am loving my bedroom without the yarn dresser in it. The dresser used to be directly in line with the doorway; now that it is gone, I am free to walk straight across the room to the bathroom without having to swerve to the left and ram my hip against the bed frame every night. This means that, post-bathroom renovation, I need a different place to store my yarn. A lot of my knitting friends use those hanging closet organizers, but there is a severe shortage of closet space in this house, what with all the people living here. I admit, taking over Brian's closet (a small walk-in) is particularly tempting; but he seems to still be using it and would probably object. Remember Andy, our handyman, who you all were so generous to? He showed up at our house the other day, looking thinner but rested. I almost wept with relief. "Just stopping by to see if Larry has anything planned," he said. "I'm looking to do a little something." "Planned? PLANNED?" I said. "The man's getting ready to rip out our entire basement." Andy's eyes lit up. I swear, I saw dollar signs in them. So he and Larry got together today and mapped out their plan of attack and my assignment this weekend is to go downstairs and pack up everything that is not Larry's. The man doesn't trust me. He just got huffy when I suggested we toss all our VCR tapes. So this is the moment of truth: am I really going to keep games the kids play with once a year or not at all? Books that they've enjoyed but will most likely never look at again? It's time for hard choices, but I do know how happy I feel when I'm not surrounded by a lot of clutter. Also, those cabinets down there could hold A LOT of yarn. In other news, it tried to snow here today, but not much fell. Susie valiantly pretended that it was a real snowstorm, however. "No one wants to come out and sled with me," she complained. Uh, yeah, honey, that's because it is really hard to sled in less than 2 inches of snow. In OTHER other news, my Gaiam ball chair arrived today. 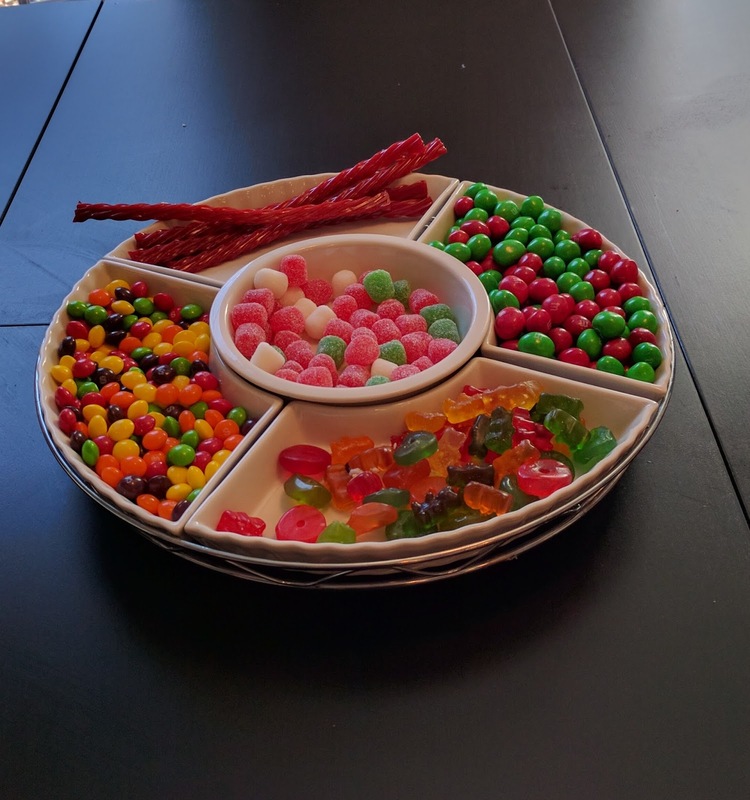 I've been coveting it since I tried one at my friend's house a few years ago, and last week they were the deal of the day at Amazon, at something like 40% off. 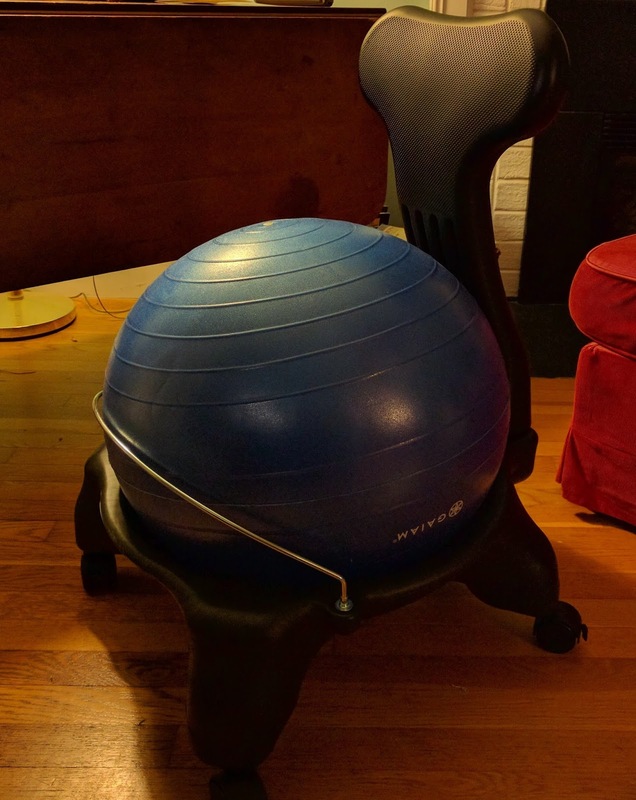 My theory is that it will keep my back from hurting when I sit at the computer, as I seem completely incapable of sitting in a normal chair for any length of time without discomfort. I have to keep doing weird things to alleviate it, like sitting with my legs crossed on the seat, or kneeling with my feet tucked under me. I get a lot of exercise, sitting. Also, I REALLY annoy anyone seated near me at the movies. 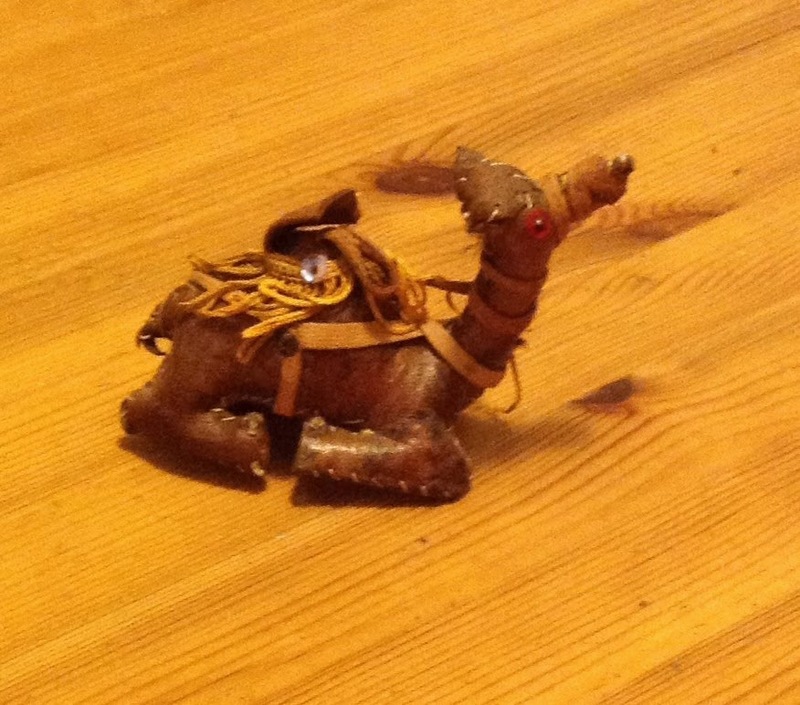 So my kids are all, "What the heck is that?" and making fun of my purchase. They don't believe me when I tell them it is going to Activate My Sit. Obviously, they are just jealous. Larry just shook his head, but I could tell he was wondering if there were a way he could deactivate that Amazon credit card that he never really wanted in the first place. Anyway, I'm using the chair right now, and it's sort of working. Sort of. Maybe I need to inflate the ball more? Vanities are being delivered to our house tomorrow (OMG, is every post for the next month going to be about bathroom renovations? Probably), which means that I had to find a place to put them. "We'll just move the dresser at the foot of our bed into Brian's room," Larry said, breezily, "and move that chair out of the corner. 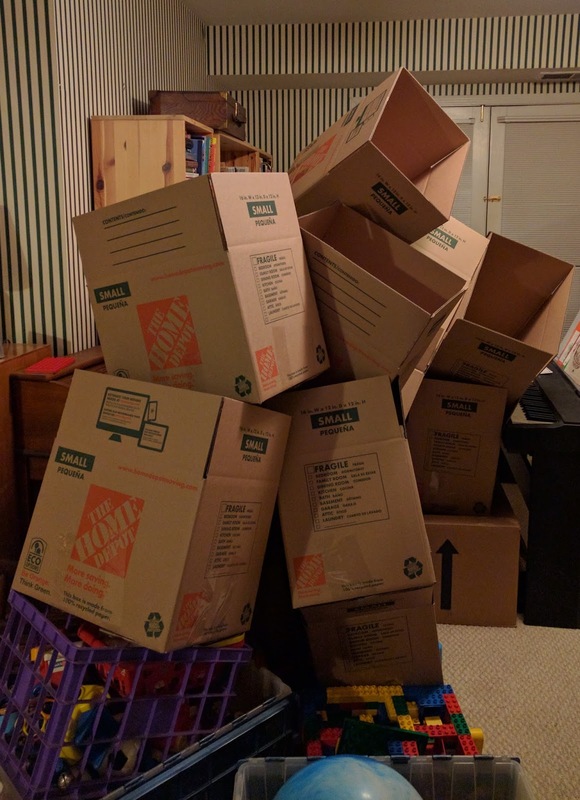 We can put the boxes there." Then he went back to reading whatever depressing news site he was looking at on his tablet and I went upstairs alone, where I cleaned off the top of my yarn dresser (shut up, it is TOO normal to have a yarn dresser), went through the huge pile of flotsam and jetsam that was sitting on the floor NEXT to the (totally normal) yarn dresser, moved the many baskets of yarn (you know, the yarn that, uh, doesn't quite fit inside the yarn dresser) downstairs to the living room (whence I had taken them while cleaning up for last week's party), swiffered the floor, picked up all manner of gift-wrapping debris, and moved the chair. That took a while. And it is only one small smidgen of what I have to do to get ready for these contractors. I'm ready to cry. At least, once these vanities are delivered, we will be almost done dealing with the place we ordered them from. The store is, I swear, staffed by the most condescending salespeople I have ever met. It was almost as if they could sense that our natural habitat is in the aisles of Home Depot, arguing over which mass market vanity would make us both happy (answer: none of them), and NOT in an upscale bathroom furniture showroom. Larry was willing to go to jail over these. They would, of course, have been right in that assumption. Nevertheless, we soldiered on, practically begging someone to wait on us because the receptionist (oh, excuse me, the concierge) neglected (twice!) to give us the magic pager that puts you on the special waiting list to see a salesperson. We finally managed to order our stupid vanities and never would have set foot in that place again, except we foolishly decided to buy mirrors framed in wood that would match our previous purchases. The condescension was even worse the second time around. I swear, the receptionist (concierge) seemed on the verge of calling security when she saw us. 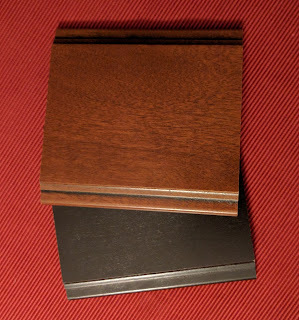 By the end of our visit, Larry was so pissed off, he refused to commit to returning their precious samples of wood within 2 days (we needed them for our trip to the paint store). Seriously, I was beginning to think he would lose his cool entirely and I'd have to post bail. It would have been worth it, though. TOTALLY worth it. 26th Anniversary - That's Sheetrock, Right? I lost, folks. In our annual competition to see who will remember our anniversary first, I am usually a strong contender; but this year? Larry won right out of the gate. "Happy Anniversary!" he shouted at me (lovingly) as soon as I opened my eyes on Tuesday morning (which, if you will recall, is the same morning he couldn't even remember that our daughter needed to go to school, ahem). I don't know if it was a fair win, though - I mean, I didn't even KNOW what day it was at that point. 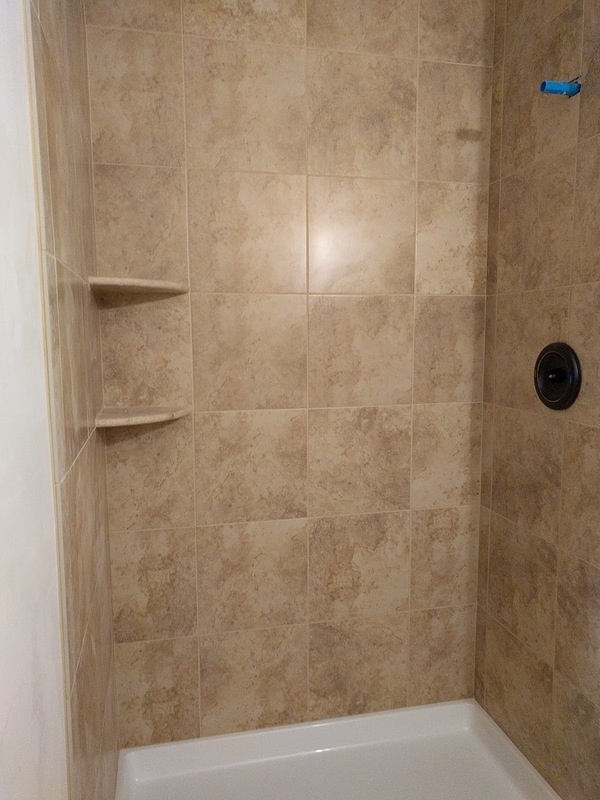 I have to clean out my entire master bathroom and part of my bedroom this weekend because contractors are coming next week to rip out our existing bathroom and install one that actually works. That's right - soon we will actually have shower tiles that don't move when you push on them, shower doors that don't fall off the track and land on my head, and a toilet that does not insist on flushing itself in the middle of the night. Best of all, I will be able to take a shower without having to wait for one of the kids to finish theirs. I swear, with all 5 (7 over the holidays) of us wrapped in towels and waiting in line for the one shower that works in this house, it feels like living in a college dorm -- only, uh, less fun. WAY less fun. I would like to note here that my sister-in-law and her husband managed to raise 3 girls to adulthood in a house with one bathroom. ONE toilet. ONE sink. ONE shower. Anyone who has teen girls can appreciate the enormity of this feat. So maybe I should just stop complaining. When the contractors finish the master bath, they will be doing the same thing to the bathroom in our basement. 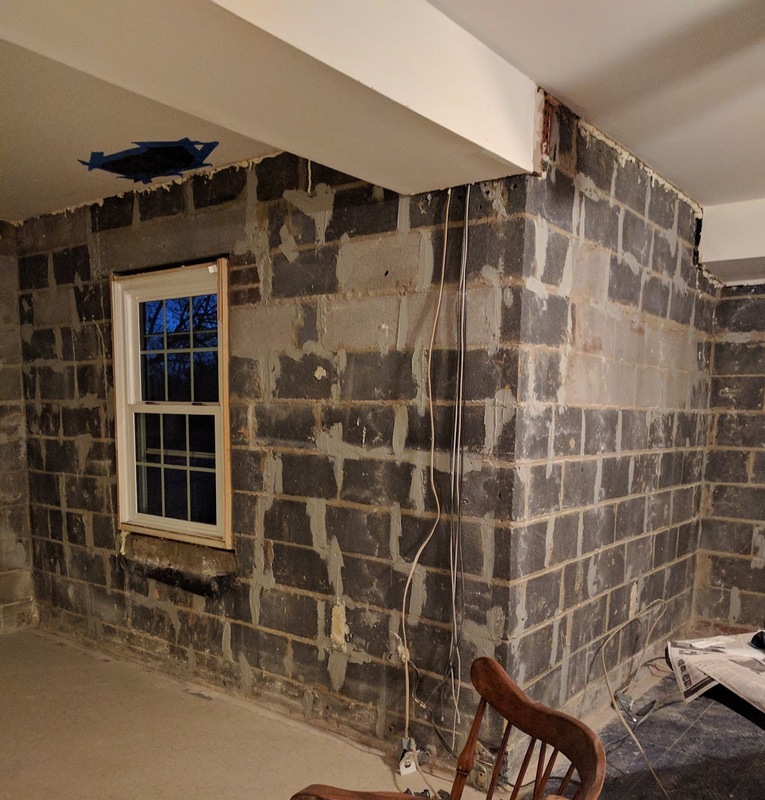 And, because Larry (as we know) is no half-measures kind of guy, he is going to spend this month ripping out all the basement walls and the flooring. Why? So he can install insulation, of course. As for myself, I am going to spend the next month trying to pretend that NONE of this is happening. Last night I thought, Hey, why don't I go to bed at a reasonable hour and wake up bright and early for once? So I tucked myself in around 9:30 and fell asleep shortly thereafter. Healthy! By 11:30, I was lying in bed, wide awake, as Larry snored gently (for him) next to me. By midnight, I gave up and went downstairs, clutching my blanket and my book. I did the NYT crossword puzzle. I played SET on my IPad. By 2 AM, totally fed up, I threw together all the ingredients for our applesauce breakfast cake. Have you ever tried to chop walnuts quietly? It's challenging. Now that I am in my 50's, normal sleep hours elude me. No matter how tired I am in the evening, I am better off waiting until midnight or later to go to bed. Any earlier, and my body thinks it is just a nap. This would be fine if I weren't a confirmed morning person. That's right: if I sleep past 7:30, I feel sluggish and my day is ruined. Ideally, I need to be up at 6:30 or 7:00. Being middle-aged is so much fun. You know what else is fun? Getting back to normal life after the holidays. Yesterday morning, Rachel was up and about at 6:30. "Why are you awake?" Larry asked her. She looked at him with a mixture of pity and disdain (believe me, she has plenty of practice at that). "I have school," she said. Well, well, well, what have we here? A brand new year, full of unsullied days just waiting to be lived to their fullest? Don't worry, we'll fix that. In the meantime, I enjoyed what is my very favorite day of the year. 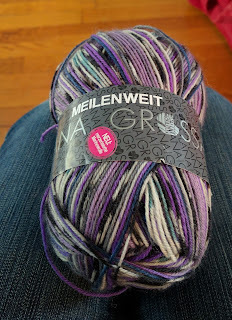 I spent it knitting (all right, belatedly finishing promised Christmas presents, if you must know) and eating party leftovers. In the interest of full disclosure, I have meringue-cookie crumbs all over the front of my shirt. Yup, it was that sort of a day. 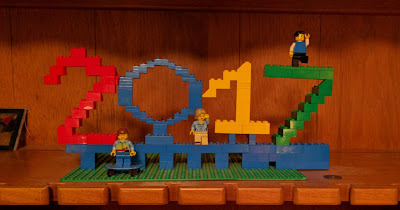 Because, oh yes, we held our annual New Year's Day party yesterday. And the prep was pretty much as grueling as ever, except Susie really represented by cleaning up THE ENTIRE BASEMENT while I was at yoga on Saturday morning. Long-time readers will recall that this is the same child who, at the age of 7, actually replaced a roll of toilet paper on her own initiative. Yes, she is a keeper. Theo, our Army officer, showed up last Friday, home from the Middle East after 7 months. I spent all day Friday cooking things I knew he would like, and I was amply rewarded by his saying, "I forgot how good American food can taste." So, yes, he, like Susie, basked in the glow of my unadulterated adoration for the weekend. What with getting ready for the party and Theo's homecoming (not to mention Chanukah, and oh yeah the annual gingerbread house party), the week between Christmas and New Year's was crazy busy. I kept thinking, "This is vacation week. I should be sitting around knitting!" But that never happened. Maybe because Larry, with his supernatural ability to pile on, decided that this would be the PERFECT week to start looking for a new car. We all know Larry by now, right? The spreadsheet guy? The "go big or go home" baker? This was no ordinary car search. I kept saying, "There's no rush - we're not selling your old van to David until March. We don't have to make a decision right now." But every time I came within shouting distance of the man, he'd start saying things like "What do YOU think is the difference between a 2-year-old car and a new one?" and "Maybe I should get an 8-year-old car real cheap" and "Do we need another minivan or should we go smaller?" This happened so many times a day, I can't even count. When I would remind him that we had already discussed these issues and I had already given my opinion on all of them, he would look hurt and huff (as is his wont), "I'm only trying to make a good decision here." All of which is really cute if you aren't trying to get ready for a big party and you don't have a house full of kids, grown and not, waiting for you to make dinner. As it was, it ended with me saying, "I DON'T CARE. BUY WHAT YOU WANT." Which, come to think of it, may have been his ultimate goal all along. So, yeah, somewhere in there he bought a car. And we cleaned the whole house. And I went to the grocery store gazillion times. And now, here we are, in 2017, and I have no idea how that happened.